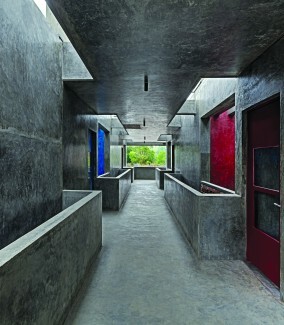 A school with a purpose, a design team with a green agenda and a building which respects the environment holistically. Green amongst the greys provides an organic relief from the confines. Known for its conscious tolerance to various experimental design and architecture, Bangalore is home to a school like no other. Axis Pramiti in Kanakpura has an ideology towards its approach to teaching, to break away from stringent programmatic schedules and try to instill an education through learning with the environment, rather than of the environment. “Climatology” is a big word and such strong ideologies compel stronger design values. The designers at The Purple Ink Studio designed a building that is not only climate sensitive and vernacular, but is also flexible with regard to the functional spaces that are so essential for schools. 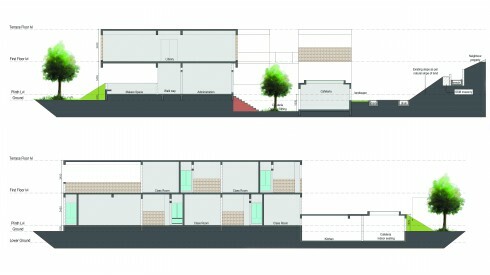 Poised on a steep sloping site, the terrain dictated a lot of aspects in the planning of the school building. “The design process for the built forms was initiated by understanding the climatology of the surroundings and the plan was to make the best use of the existing local climate. The site is north facing and has a vast open space on the east side which is a designated playground area. 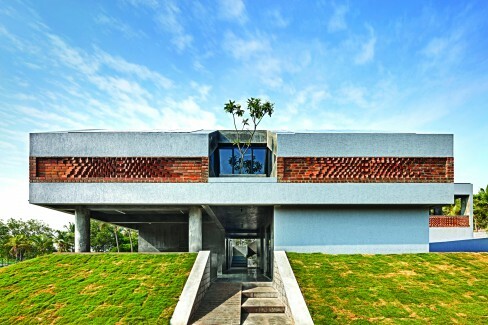 The design scheme was conceptualised on generating continuity with the surroundings and drawing these lines into the interiors of the building,” highlighted the design team. the way it is integrated into the daily academic functioning. Pergolas provide both shade and light efficiently; the daylight dancing through them provides drama all through the day. Each classroom opens out into a pergola-roofed ante space that not only functions as a space to overflow into but also as an instigator for ventilation. The openings in the roof draw out any rising hot air that is retained inside the class rooms and expel it. 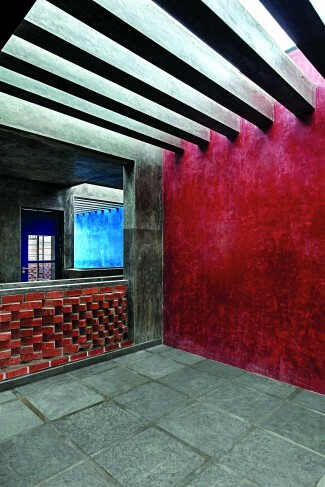 Brick jaali walls further help in bringing in light and augment ventilation all through the year. The school is designed in 2 levels; the lower level houses the classrooms and administrative offices while the upper level has the more confined spaces like laboratories and AV rooms. This charming space takes care of all three essentials, light, shade and air! Varying climatic conditions demand strategies that will tackle the hot and humid weather in a place like Bangalore that used to be once temperate. Light wells in the double-height corridors further underline the climate sensitive design of the school that is evident throughout. 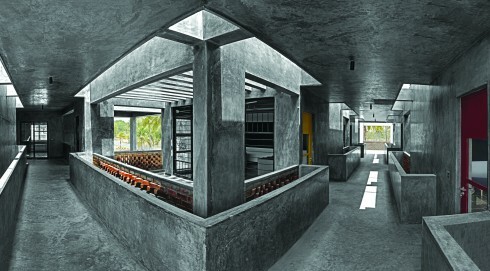 Low maintenance materials in the form of tinted cement plaster, Kota stone flooring and smoothened IPS flooring create a rustic and natural feel while ensuring the absence of VOC’s and making the interiors that much more environment friendly. 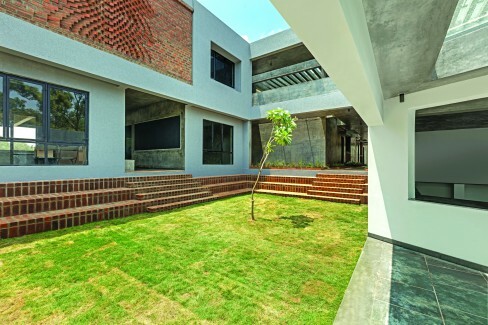 Being a school campus that boasts of assets that define environment friendly practices, on the site level, the team at The Purple Ink Studio incorporated minimal hardscape surfaces in order to be able to harvest rain water to the maximum and help recharge the ground water levels. Allowing place for students to overflow into from the classroom gives us a hint of the efficient design detailing. 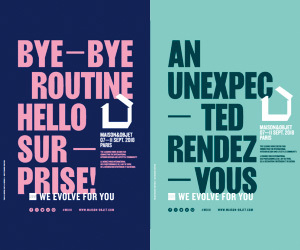 My favourite British architect Richard Rogers once said, “The only way forward, if we are going to improve the quality of the environment, is to get everybody involved.” To do that, imparting environmental sensitivity through our education system is crucial. 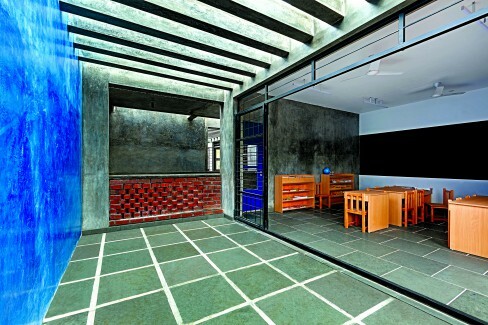 That movement is clearly seen reflected in the Axis Pramiti School, thanks to its perfectly orchestrated sustainable design planning by The Purple Ink Studio.